A bit of paint therapy for a very stressful time 🙂 There is just something about getting all messy and immersed in the moment so that I can clear my head for other issues when I am ready. 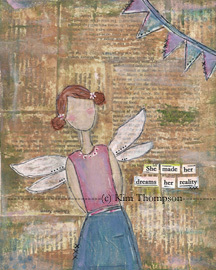 This little lady is mixed media: She has a book page background, covered in gel medium. The background was given a more vintage feel using Tim Holtz distress inks. Finally, she was painted on using fluid acrylics, Faber Castel Pitt pens and permanent marker. Love her! Love and strength to you! That’s a great idea Nizzy! Love the soft colours in this – so pretty. And yay for painting as stress relief!